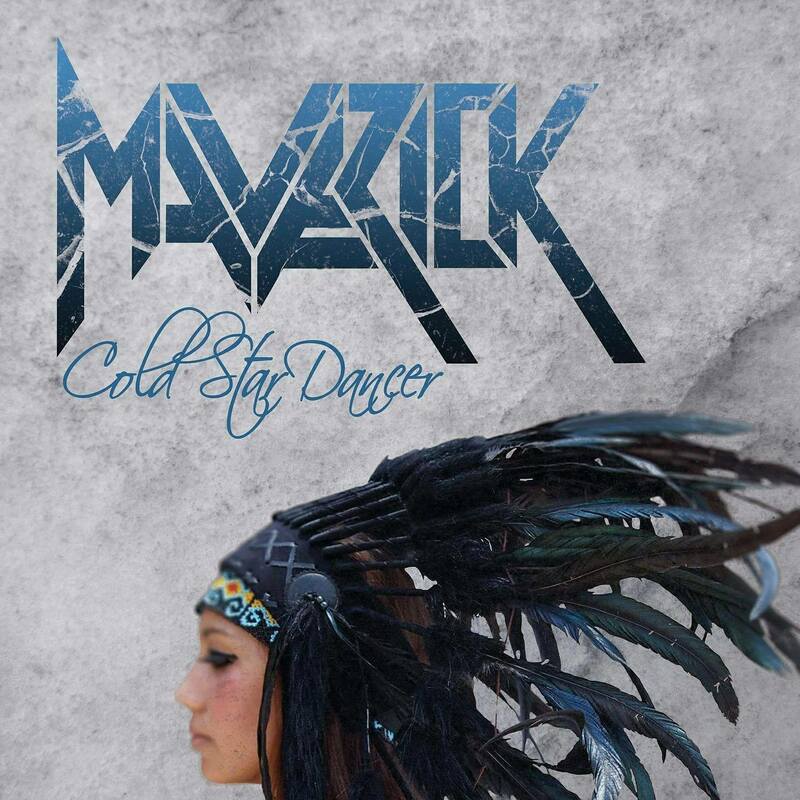 I guess that I have a tiny bit of bias to admit to before I start this review – Maverick is one of my favorite bands from Northern Ireland, potentially of all time. I’ve seen them live a couple of times, and they put on one hell of a performance. While this may mean I’m more likely to think this is a masterpiece without even listening to it, there’s always the flip side of the coin – I may end up being even harder on these guys purely because I know and have heard first-hand, just how good they can be. So, it was with no small amount of trepidation that I clicked ‘play’ for the first time on Cold Star Dancer. Would I be blown away by just how awesome this album could be? Or would I be left with a feeling of ‘what if’, that this could be better? Well, there was one way to find out. From the opening drum and guitar salvo in the title song, I immediately felt a sense of ‘thank god for that’ sweeping over me. I’ve found in the past that if the first song didn’t grab me, then there was a good chance I wouldn’t enjoy the album. Luckily, this song immediately played to their strengths, showcasing the ever-improving David Balfour’s vocals. There’s a sense when you hear him singing that he has a similar voice to some of those great vocalists from the past – one name that springs to mind (for me at least) is Steve Perry (from original Journey). I’m not talking Don’t Stop Believing – I mean some of their other songs, like Still They Ride. For me, he had one of the best voices in rock, and Balfour is certainly moving to the top of the pile in Northern Ireland. Devil’s Night continues showcasing his voice, but the guitar work and drums on show here show how far the guys have come since their debut album. The first time I saw them live, you could see there was the potential there, but it was very much in the form of a rough diamond. This album shows that they’ve taken their original craft and musicianship but refined it brilliantly. There’s a real sense of togetherness and synergy on this album that raises it up to another level. Dusk is an odd song to review – it’s essentially a minute and a bit of drum and (possibly) a synthesizer or guitar. However, it does give us two things – one is a glimpse at how Maverick might start their concerts in the future (this in a double hit with Ex Machina would be perfect), and the other is, strangely enough, the perfect intro to Ex Machina. A minute and a bit of an intro on a song can sometimes be a bit excessive – but there’s a masterstroke here by popping it in as a separate song. Ex Machina is a rollicking crowd pleaser – this is definitely one that will get the masses on their feet, their heads banging and the atmosphere building. In fact, if you close your eyes while listening to it, you can almost imagine yourself at a Maverick gig. Goodbye is probably the closest we’ll get to a ballad on a Maverick album – yet it doesn’t sacrifice any of their natural style of playing. How many times have we heard bands who play one way completely lose it when they try to perform a ballad, purely because they decide to go completely ‘lighters in the air, grab your partner tight’ rather than trying to marry the style of the ballad with their own way of playing? It’s always interesting when a band decides to do a cover – often these don’t quite work. The main issue is usually – just how close do you need to be to the original? Finding that fine line between recognizable and outright copy can be quite difficult – luckily, Maverick has been able to turn Jessie’s Girl up a notch, and Balfour’s voice comes into its own here. He’s able to add that slight edge that’s really needed for such a classic song – it’s not quite bitterness at not being able to have Jessie’s girl…but it’s pretty damn close. Kings sounds like a song that could, conceivably, have been sung by Thin Lizzy at the height of their powers – it’s a brilliantly constructed piece that immediately sends you back to the 80s (in the best possible way) with the image of dropping a couple of coins into the jukebox just to hear it. We’re just over halfway through this album, and I think it’s clear what way this review is going to come down. Kiss of Fire doesn’t change this in any way, shape or form. In fact, if anything, it reinforces my view – this is one of the best rock albums to come out of Northern Ireland in many years. Which is saying something – the Northern Irish rock scene has been churning out some special bands over the past few years. Magellan Rise is the sort of name that you would associate with a sprawling epic of a song – maybe 18 minutes long and with a myriad of guitar solos, quieter bits and telling the story of a sailor making his way in the world. While this isn’t quite an epic (it’s just under 5 minutes long), it’s still a brilliant song that brings together all that is great with this album. Myrmidon, meanwhile, opens with the sort of high-speed guitar and drums that we’ve heard from these guys in the past – but as with the rest of the album, there’s a restraint and maturity to the song that marks it as similar to songs from the previous two albums, but subtly different as well. In fact, for a relatively short song (yes, I’m counting five minutes as short), they don’t half pack a lot of stuff in. This is quite possibly the standout song on the album for me – it really does have a bit of everything. Seize the Day is, quite simply, a quintessential rock song – great guitars and showing off the full range of Balfour’s voice. In fact, if I have one criticism of this album (and believe me, that’s hard to find), it’s that we don’t really get to hear his full range – as I said before, he has a frankly incredible voice, but it feels somewhat restrained here at times. However, the more I think about this, the more I come to the conclusion that this is a sign of the band’s new maturity – with a weapon like this at your disposal, it would be far too easy to rely on it to carry the album. By reining it in a bit, it allows the other area of the band to shine – and boy do they shine. I almost didn’t want to click ‘play’ on Viper, as by doing so, I’d be finishing the album – but am I glad I took the plunge. This song is possibly the perfect way to end this album – putting all the ingredients they have into the cauldron for one last, almighty spell. There are hints of Dragonforce here, but without the overblown 10-minute guitar solos – just the pure joy of guitar being played well, drums being decimated and Balfour’s voice washing over the top. I do have a slight problem with this album – it’s making me reassess their previous album (Big Red) that I reviewed as well. I gave that 10/10 because at the time it was one of the best albums I’d heard…so what on earth do I give this one? I’m hoping to see these guys live again soon – if this album is anything to go by, their live show will be among the best around.